The 1935 Indian Chief for sale rides and looks great and has just had a complete frame off restoration that took 2 1/2 years. In my opinion, the 1935 - 1939 model Indian chief motorcycles are some of the finest, best looking motorcycles ever made. The 1935 models were the first year the Chiefs sported the streamlined fenders with the deep valance. This bike has a red and black two-tone paint color scheme and the optional "V tank panels". The 1935 Indian Chief has a 6 volt electrical system. restorations to make comparisons and then come back here if you want to buy! This fine Indian is a must see for any collector or biker that appreciates the history and design of old motorcycles. The 1935 Indian Chief for Sale is in Dallas TX Texas. Please email if you can picture this nice bike in your collection using the comments form provided by GoGoCycles Used Motorcycles for Sale gogocycles.com) and I will respond as quickly as possible. 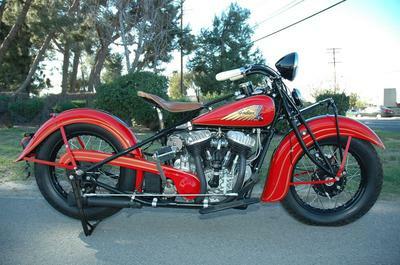 < a> 1940 Indian Chief for Sale if you would like to take a look and make comparisons. If you already own a 1935 similar to this one GoGoCycles would appreciate your taking a minute to review it to make the biker community aware of any problems that you ran into during the restoration of a similar motorcycle or to point out its most desirable features.